Well, it is finally official. Today, we start our multi-year global expedition, Jay and I exploring the world one dirt road at a time. Fulfilling our lifelong dream of traveling the world in our custom designed and built EcoRoamer, meeting people, seeing our amazing planet and hopefully doing some good along the way with our foundation (www.themuskokafoundation.org). OK, so even though it sounds like an exhilarating journey of freedom and serendipitous experiences, it might be a little more complicated than it sounds. You see, we also have our children and cats coming along for the ride (or vice versa, we shall see how all the family dynamics play out on the road 24/7). In the meantime, here are some introductions (in descending order of priority for food, naps, and bathroom breaks): Kurt – 4 years old. Very talkative, wanna be astronaut, expecting to submit weekly podcasts re the sites and people we meet. Maya – 2 years old. Flirtatious, precocious and wants to drive the truck. We shall see if this driving thing works out for her, stay tuned. Flash – 10 years old. Very brave and vocal (read meows non-stop) black kitten that I agreed to have on-board in a moment of weakness. Perl – 10 years old. The origin of the wordy “scaredy cat” started with her, but she’s little, brown and cuddles quietly. Alice (that’s me) – 35 yrs old (almost 36, yikes!) Excited about the trip, the planner in the family, worried about all the million and one things that will likely go wrong. Jay – 37 yrs old. The eternal optimist, the only one that currently knows how the truck works (and doesn’t), giddy with the knowledge that we’re finally on our way (or at least he’s kissing me a lot more than usual and I attribute it to us actually leaving….) Or, at least I hope we’re leaving! Cuz we’re currently in the parking lot of our storage place in San Francisco trying to leave. 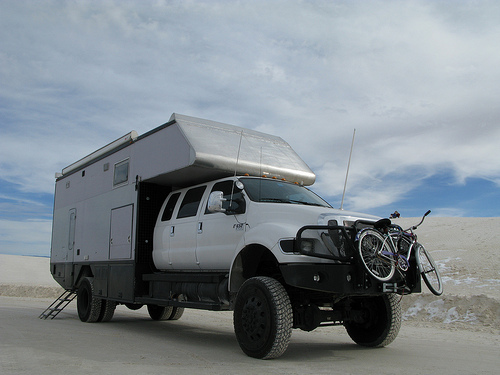 The EcoRoamer (aka truck, aka Roamer) has been parked here since our test trip to Burning Man in September. So the batteries are down and it won’t start. Jay has rigged it up so that the massive generator is charging up the engine batteries and I’ve heard “it’s almost about to start” for the last 3 hours. I trust him completely, but that doesn’t mean I can’t make fun of him! We already have a small crowd in the storage place looking at the truck and giving suggestions on how to start it. In any case, we have a packed itinerary coming up, so rather than dwell on it not happening, let me share at least what is on the agenda today: Meet up with ex-colleagues and friends in San Francisco and then see Marc Wassman. Marc is a great guy who used to be a chef and is now pursuing his dream of building expedition vehicles. He’s got the first one out already and it looks great. It’s called the XP Camper (www….) and is perfect for a couple traveling on extended trips. He designed and built it all by himself, it’s a very innovative pop-up camper that provides a lot of space for living but a very sleek profile when getting around. Each piece, from the bathroom/shower to the bed to the fridge and storage space, is designed with a lot of thought, focusing on comfort and simplicity. When we took a tour of it last (ExPo April 2009), we were amazed and surprised at each piece of the XP Camper and are looking forward to seeing the latest version. Yes! the EcoRoamer finally started and we are on our way!! !